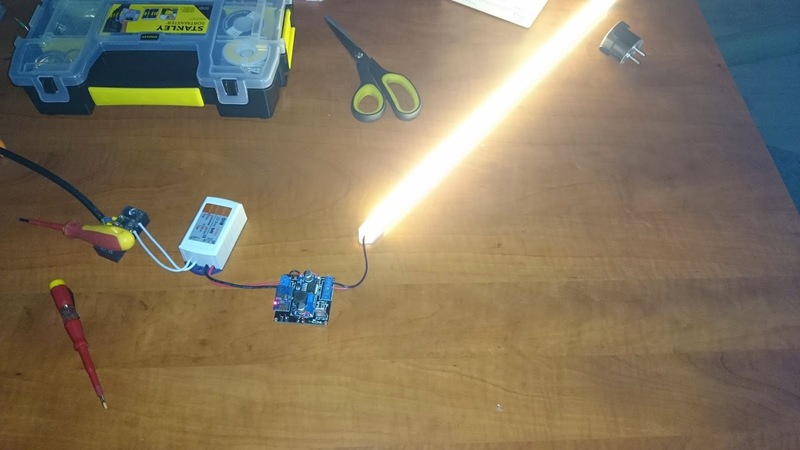 Since I now have a cheap WiFi controllable LED dimmer I’m looking at various ways of lighting rooms, hallways, etc. 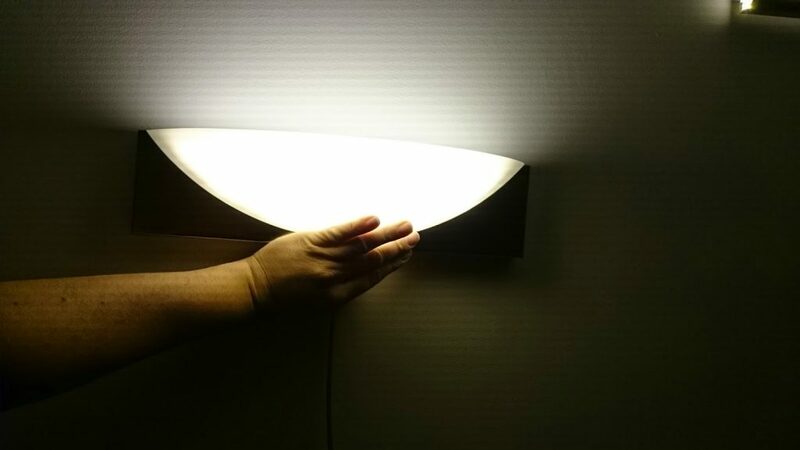 Since different rooms require different type of lighting they require a different lamp. Some simple, some more fancy. 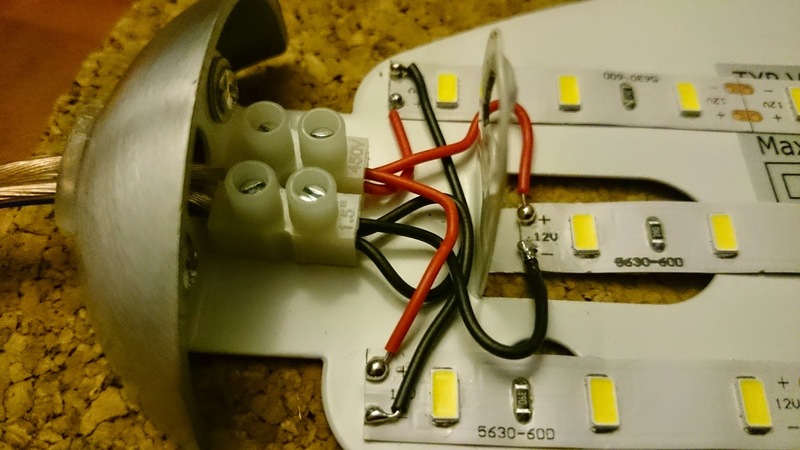 After experimenting with LED strips in aluminium profiles this post will be about hacking Ikea lamps! 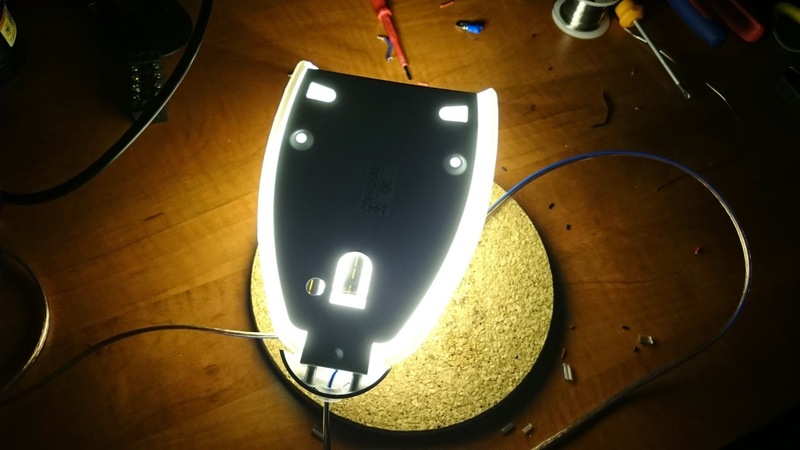 This post will describe 3 different Ikea lamp’s which I’ve hacked to now work with LED strips and my LED dimmer, they are all of different design and should be suitable to different styles and situations. They do share one common trait and that is that they use “milky” frosted glass. The importance of that is that it will diffuse the light in such a way that an individual LED will no longer be visible. 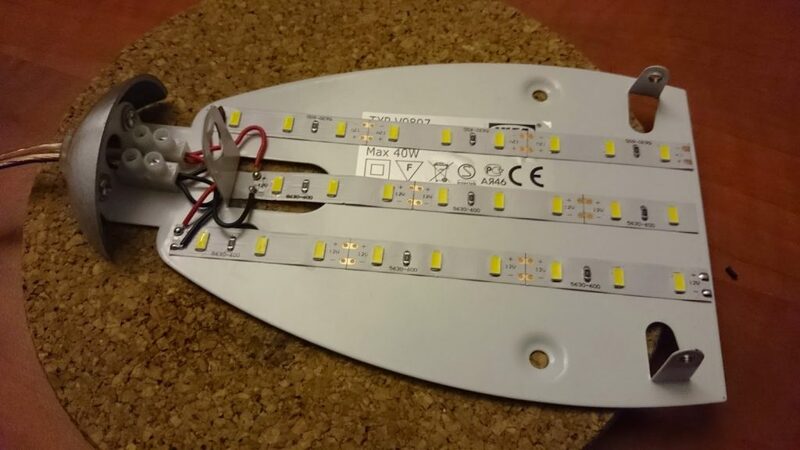 This gives you a nice and uniform light pattern and only one shadow instead if several small one’s because of how the LED strips are constructed. My first tries where using aluminium profile strips/bars from the local building shops. They have some which have a nice shape and do quite well. My problem with the light is that if you let the light shine directly upward, you still get individual shadows of all the little lights. 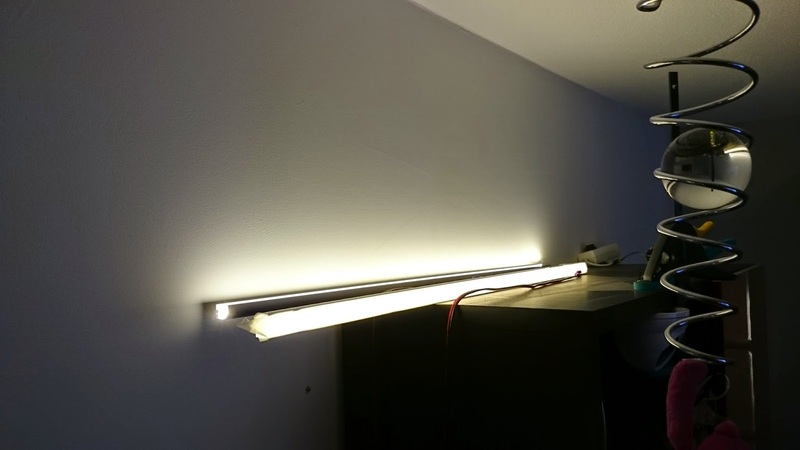 My solution which works best is to actually let the light hit the aluminium strip first and then bounce against the wall. 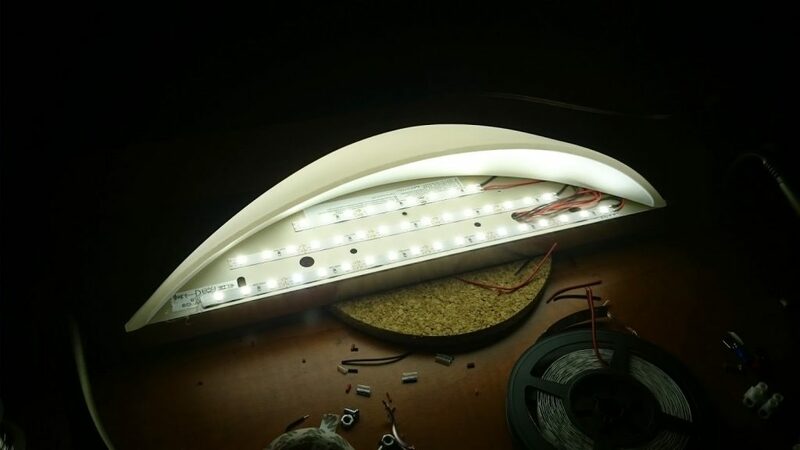 This gives a nice and even light which looks nice. 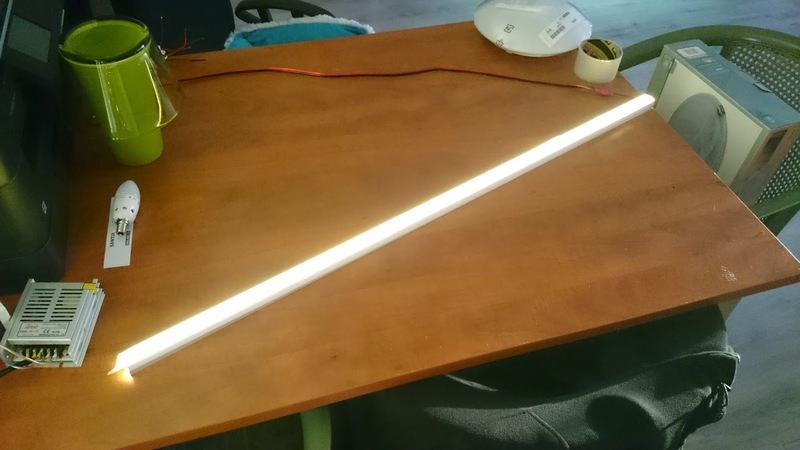 The second variant of this is using the same strip, LED’s pointed directly outward but now with white ducktape over it to diffuse the light. 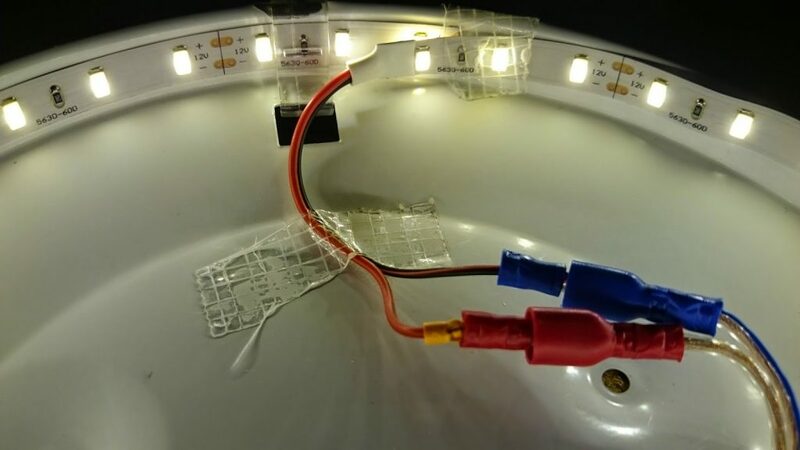 Although this works and gives you a nice and evenly distributed/lighted surface, the ducktape dimms too much and lowers the light production by about half. 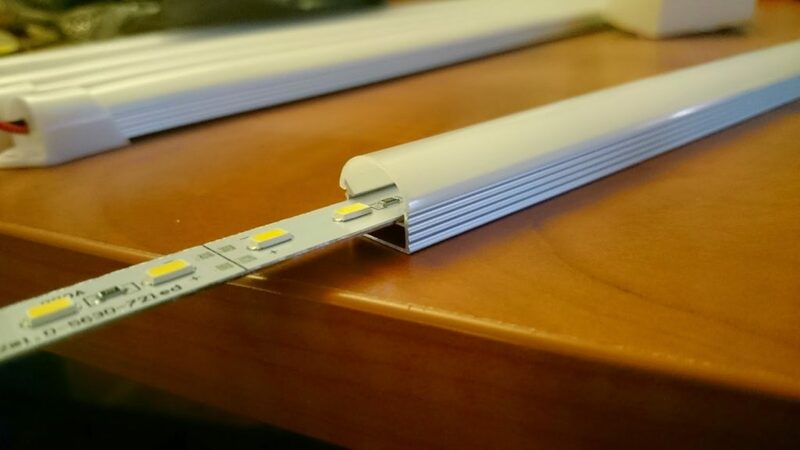 During one of my browsing sprees looking at what aliesxpress.com has to offer I came across some cheap LED aluminium profiles with rigid LED bars with a nice “milky” cover, all for a low low price! 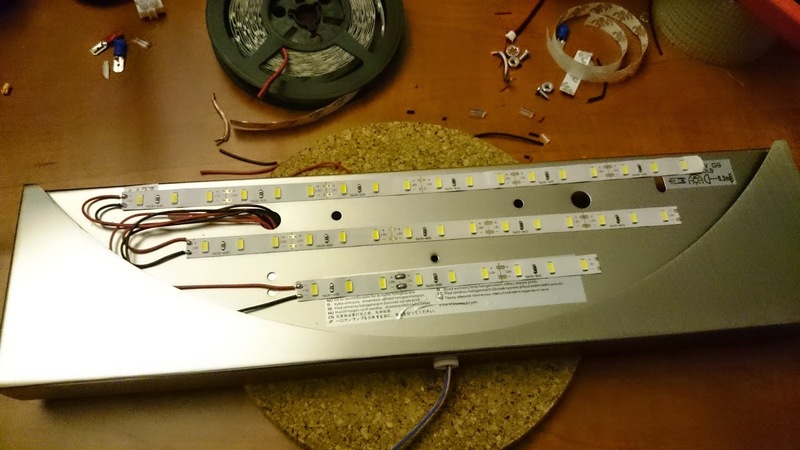 Although these work well I was really looking for a way that the would not show the individual LED’s. 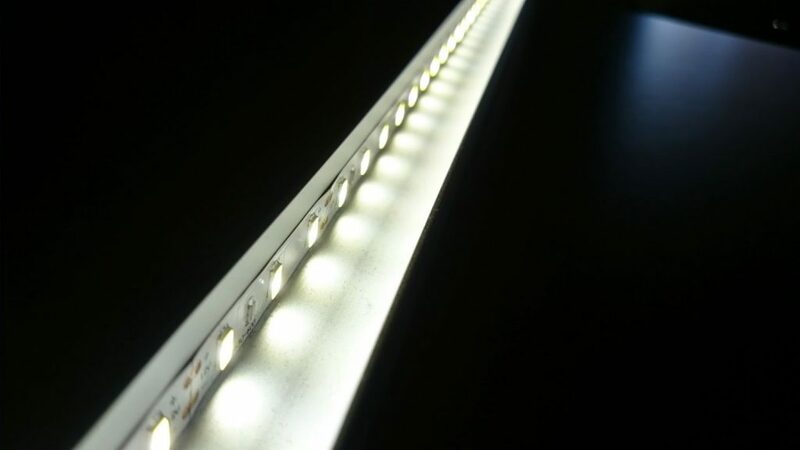 If you do not have this requirement, these strips are very good and cheap. Delivery was only 5 days after ordering because of the free DHL, very VERY good deal! 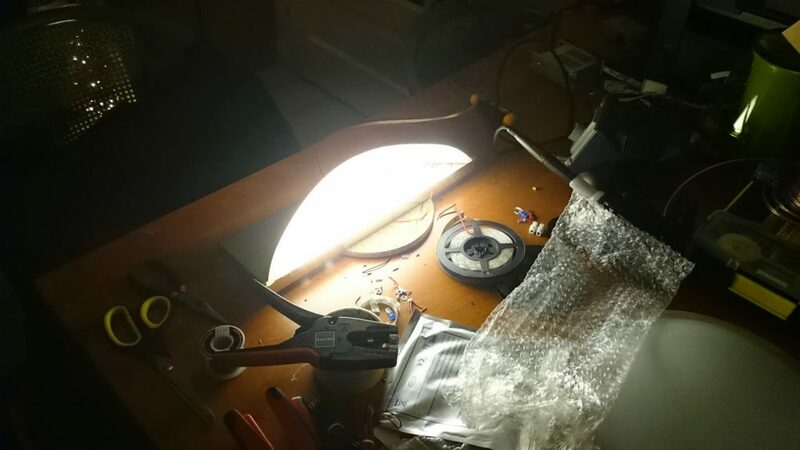 Third experiment: Ikea Lamp Hacks! 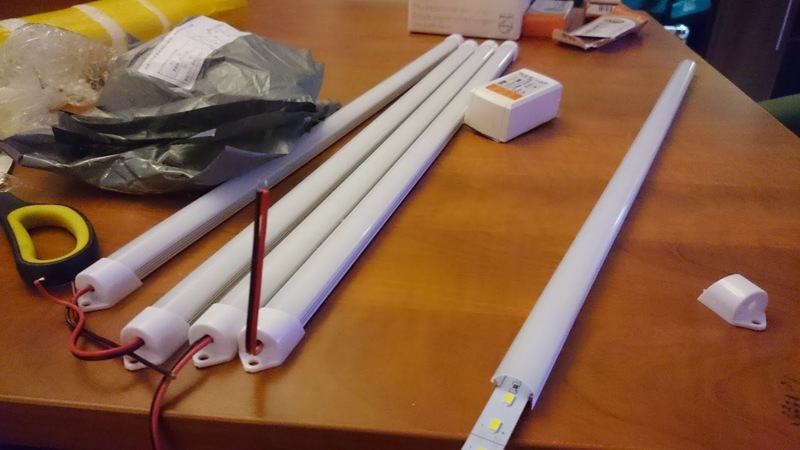 I got 4 lamps from Ikea to do experiments with. I will show three of those here (I haven’t gotten around to do the 4th version). 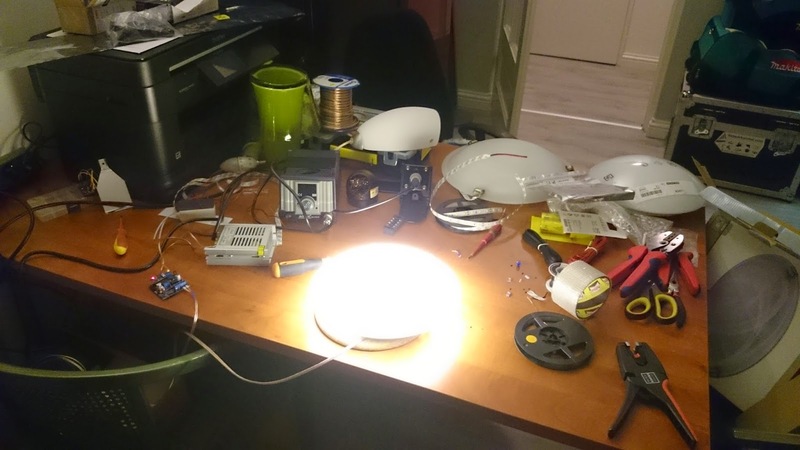 For now I’m not integrating my ESP8266 boards and PSU’s inside the lamps. I’m figuring since I can design my own cabling plan I can get them to mount close enough in the new house. 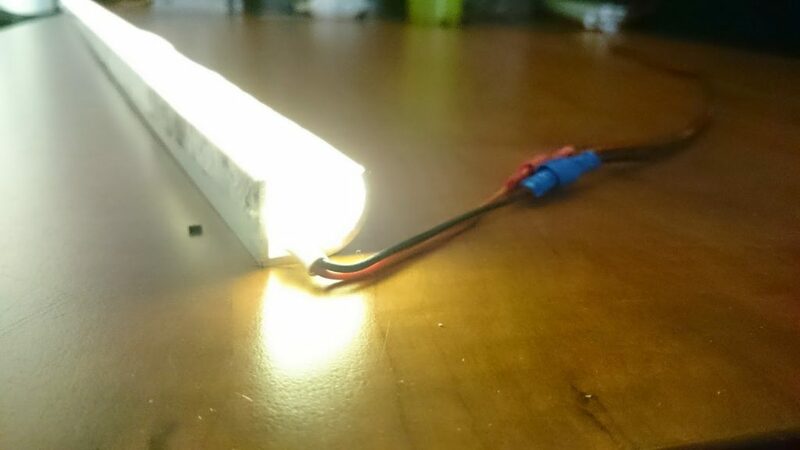 Try to make your 12v cables short length when possible. 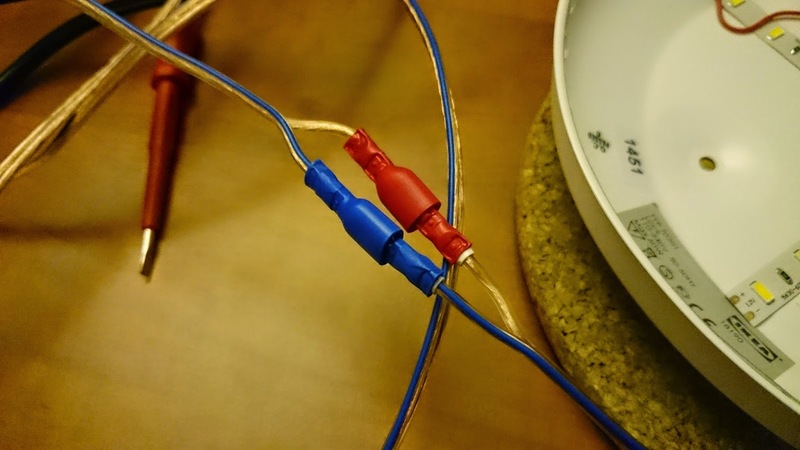 The lower the voltage the more thickness you need in your cable for a given length of cable. 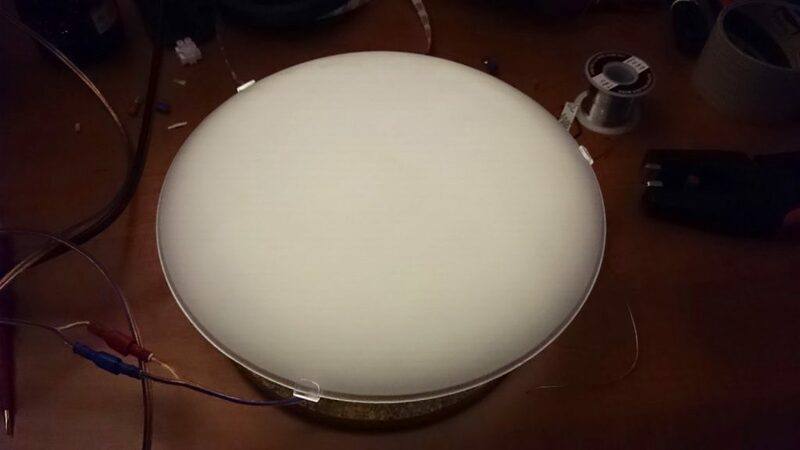 The first lamp I got is a ceiling light. I already had some of these lamps in my current home because they are dirt dirt cheap. 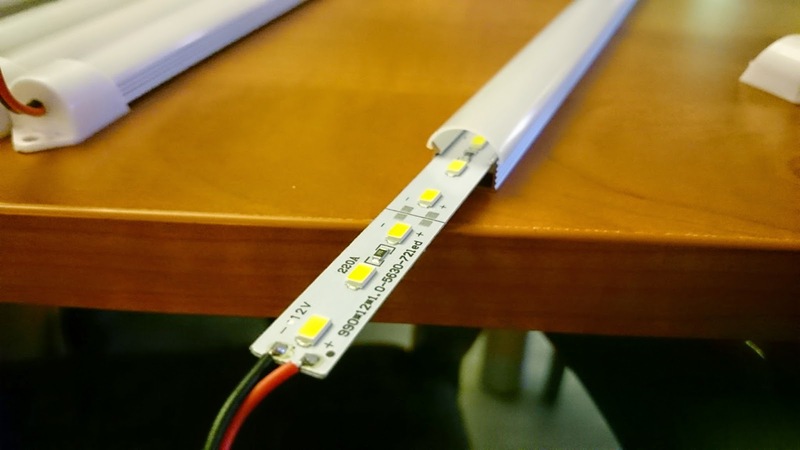 Use them with a Ikea LED light bulb and you have a very cheap and efficient light. 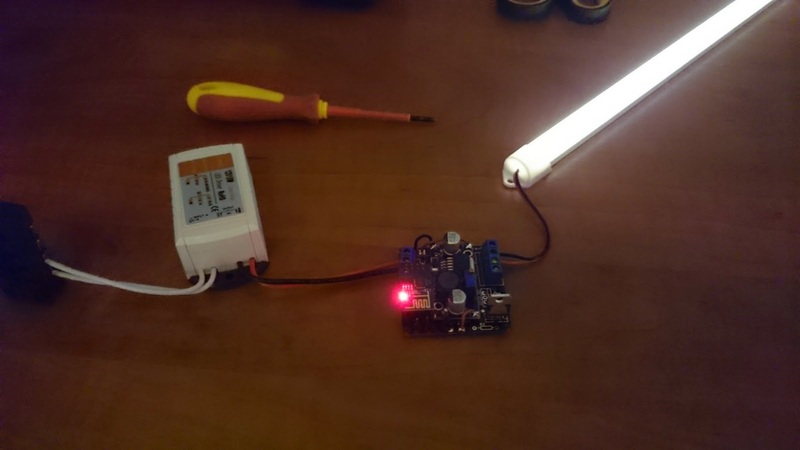 Of course we want to use them with our ESP8266 LED dimmer module! 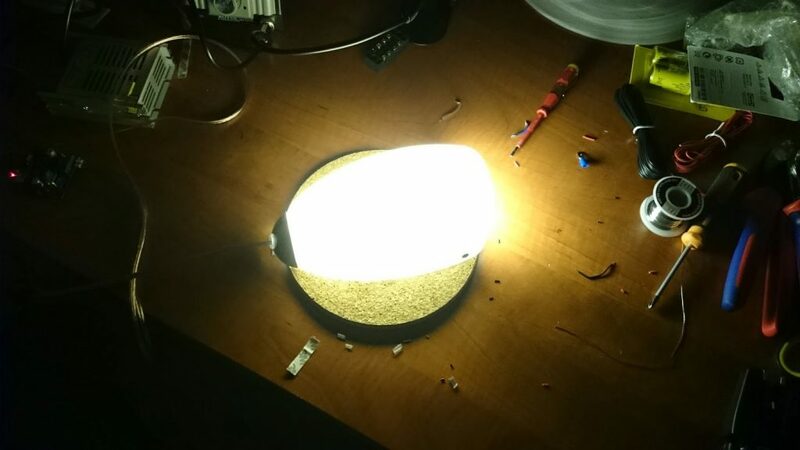 This lamp is called “LOCK”, you can find it here. 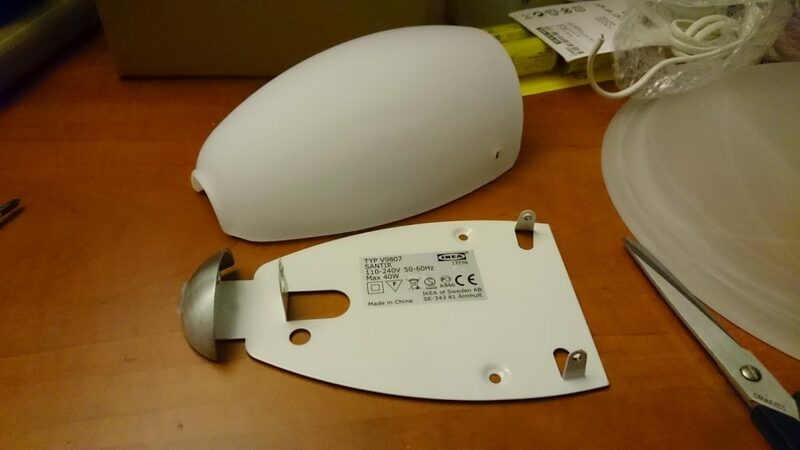 These lamps only cost 2,49 euro! A very standard looking ceiling mount half sphere light but for what it is, it doesn’t like half bad at all! 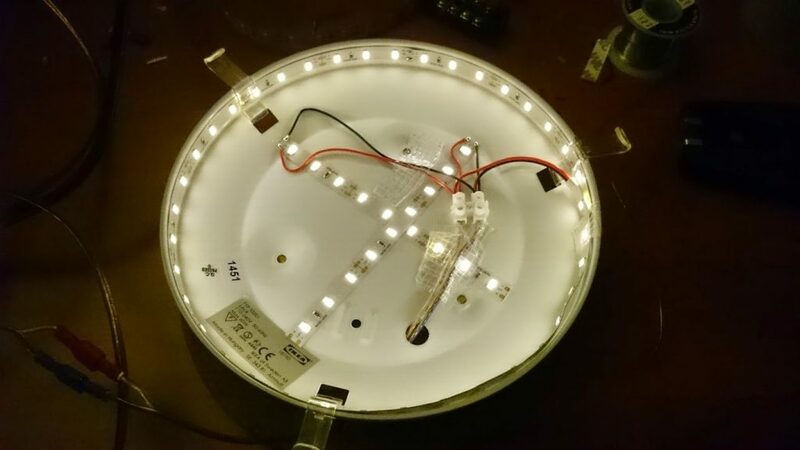 I added another cross of LED’s inside of it. 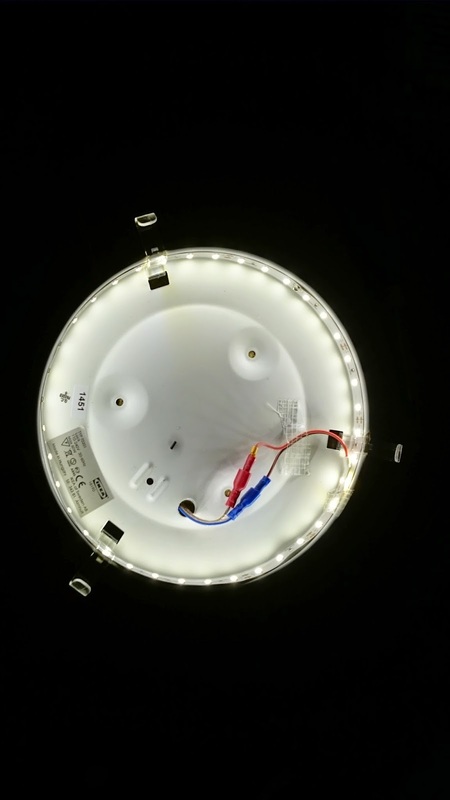 Where the outside ring give it a very evenly distributed light pattern the extra cross gives it a big boost in light levels. The amount of light is now excellent! All soldered up. Using a white connection terminal block to split the connection. The second lamp is the most fancy. 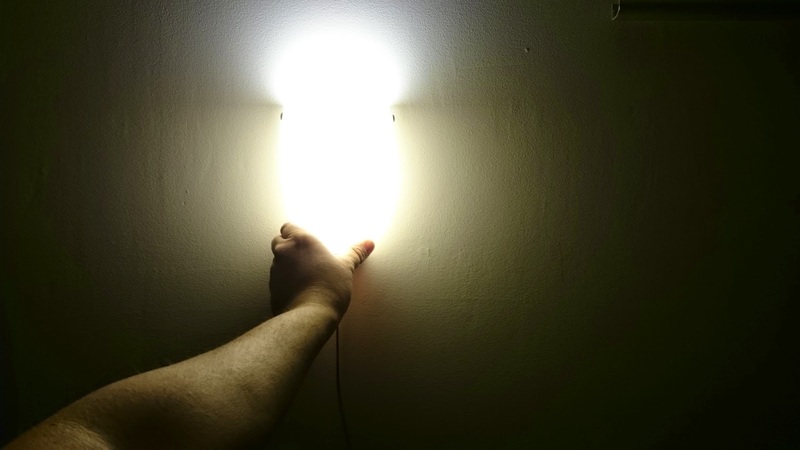 It’s a medium sized wall light. 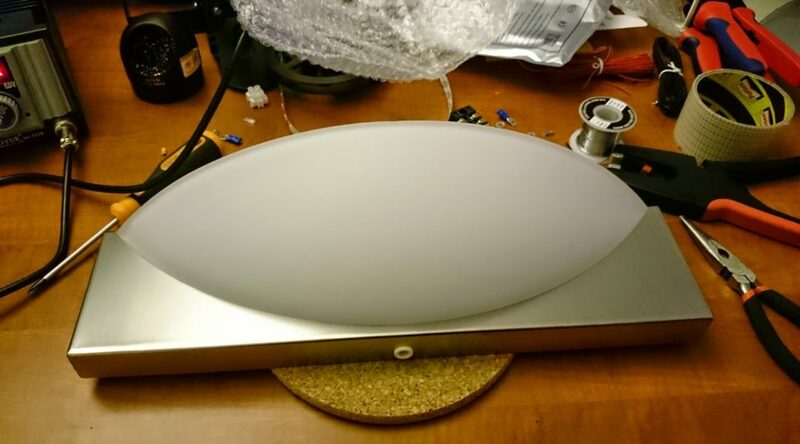 It has some fancy metal and glass front and looks quite nice. 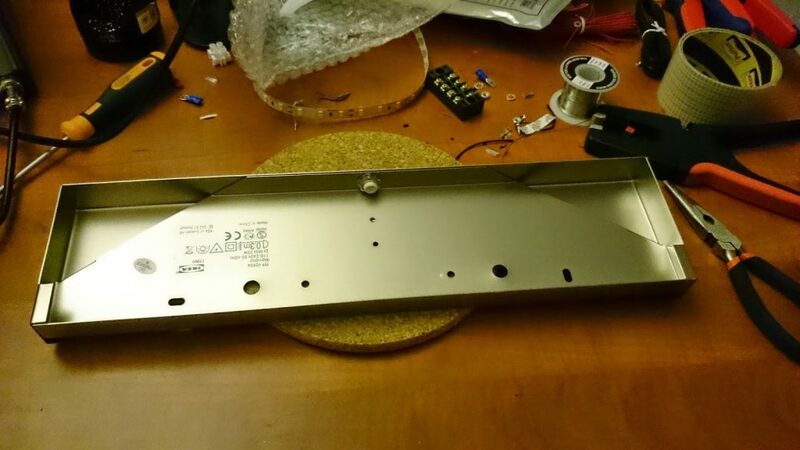 The interesting part of it is that the back side of it might have enough room to actually house the ESP8266 board + PSU. 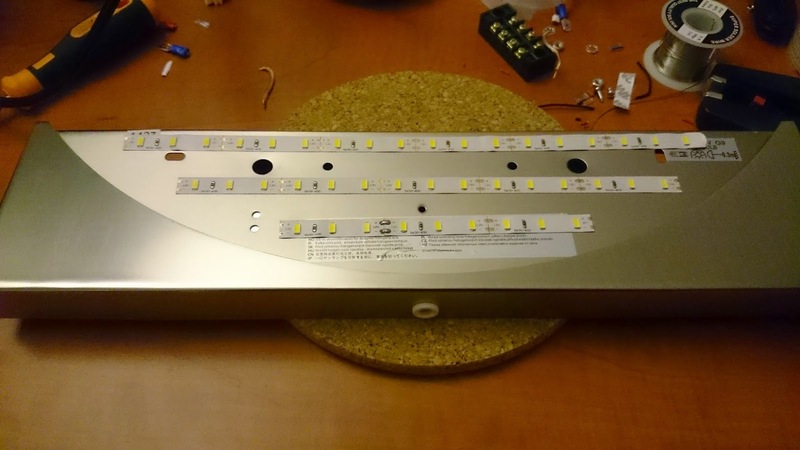 I can see one of these in the middle and then 2 of lamp 3 on the sides in a hallway or something and all the electronics and PSU could be housed in the middle lamp. I’ll try that when I get my parts in. 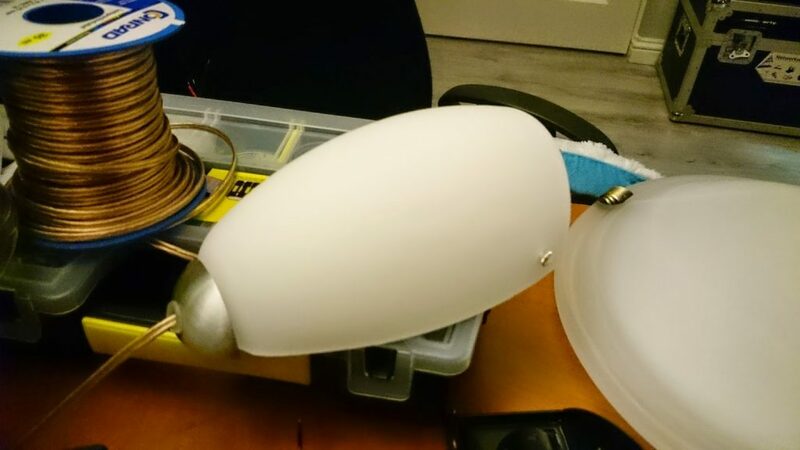 This lamp is called KLAVIATUR, you can find it here. It costs 14,95 euro. Back side with all of it’s guts removed. Maybe, just maybe there is enough room to house all the components needed! 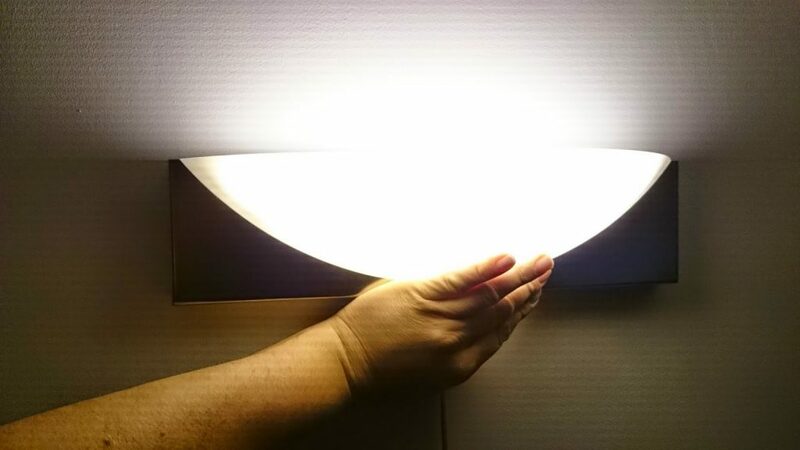 The third lamp I bought was a small wall light. Again a nicely frosted version with a metallic highlight. I think this light was the most fun to modify because it’s quite cheap but still gives you a very nice and sleek nice looking wall light! 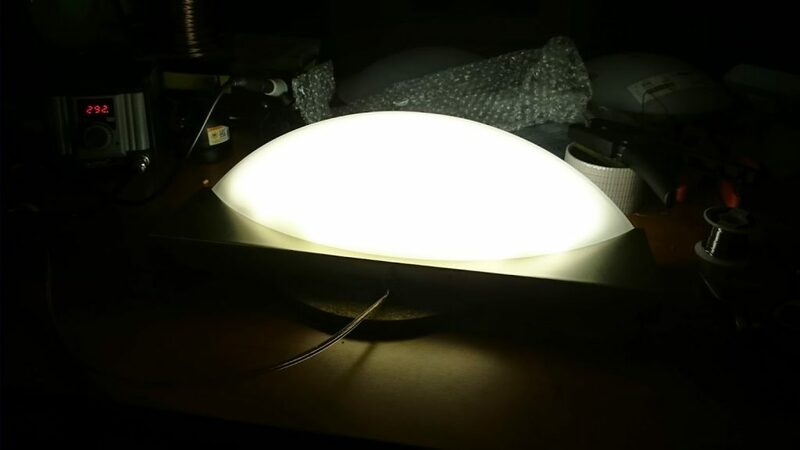 This lamp is called the SANTIR, you can find it here. It only costs 4,99 euro. The finished version, as I said above you can reroute the cable through the back making it even nicer! And that’s it, all of these hacks turned out quite well. 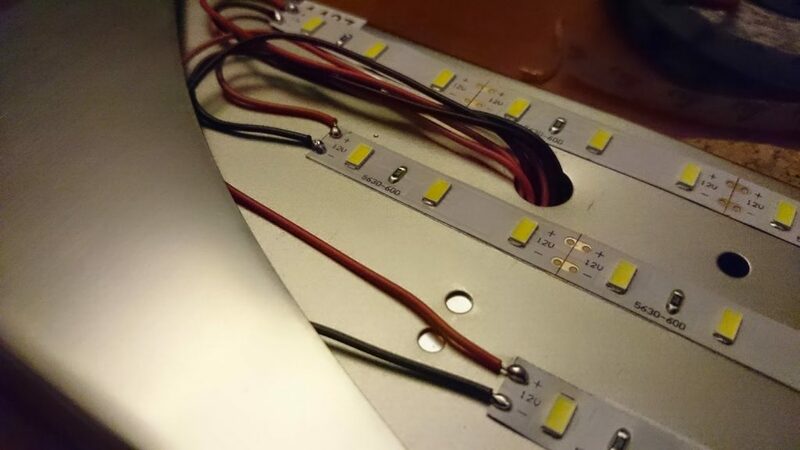 Hiding the individual LED’s quite well, providing a nice and smooth/even light. As I wrote above I think Lamp 3 is the best success. It’s just so cheap to buy and modify and it looks awesome! 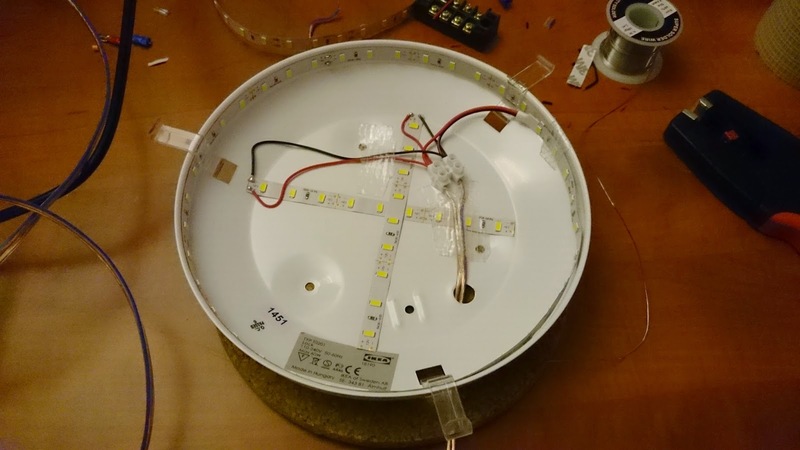 The light it produces is also very nice and warm, when hung at the right height you will never see the individual LED’s and you can easily run a few of them using one ESP8266 module. Brilliant work! Great inspiration for some of my plans, thanks for posting! So do you turn them off just via your mobile phone or does an actual physical switch turn them on. 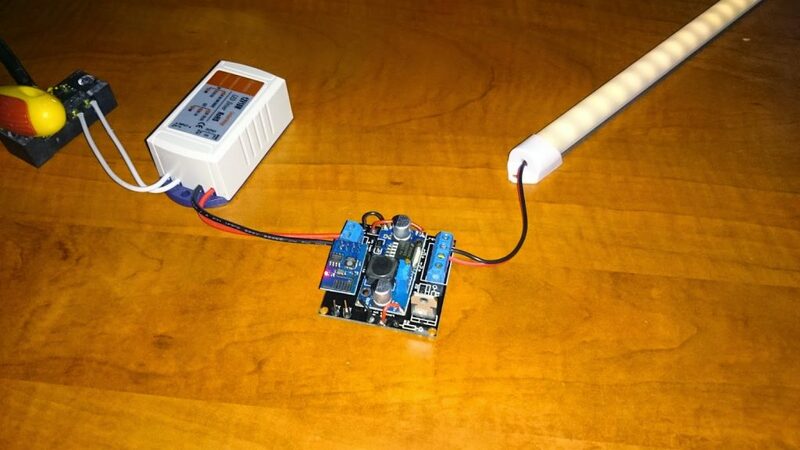 Can you do it both ways to either turn them on remotely or with a normal switch? Would that require a relay?